Toner for Earth Year-End Sale! | TonerGreen - Eco-Friendly Toners from the U.S.
Toner for Earth Year-End Sale! Tis the season to be jolly...Yes, it's that time of the year once again! For many businesses, the end of the year is time for the SUPPLIES SHOPPING SPREE! As consumers get ready for the holidays, businesses are getting ready for next year's tax season. Start your shopping spree at Toner for Earth. Simply log on to TonerForEarth.com and stock up on TAX DEDUCTIBLE PRINTER INKS, TONERS, and SUPPLIES. Save hundreds of dollars as Toner For Earth gives you 5% OFF and FREE SHIPPING on orders over $200! 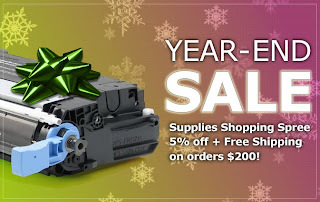 Use your coupon code TFEYEAREND and enjoy your savings! Toner for Earth offers remanufactured toners for Brother, Canon, Dell, Epson, HP, Konica-Minolta, Lexmark, Okidata, Panasonic, Samsung, Sharp, and Xerox. Note: This promo is exclusive to Earth-Friendly Remanufactured Toner and Ink Cartridges. Join our mailing list: If you enjoyed our discount coupon, please make sure that sales@tonerforearth is added to your email address book.